Exchange traded fund (ETF) investors in Europe backed US equities through 2018 – until the December downturn caused an about turn in sentiment. The best-selling global category with European ETF investors last year was US Equity Large Cap Blend, which saw net inflows of €18.6 billion according to Morningstar Direct data – more than any calendar year in the past decade. Meanwhile, US Equity Large Cap Growth ETFs also saw their highest amount of net inflows in the past 10 years last years at just over €1 billion. But that’s likely to reverse over the course of 2019. In December the Large Cap Blend category saw its biggest – and only – month of net outflows, €983 billion, since April 2017. The net outflows of €370 million from the Large Cap Growth category amounted to the most quarterly negative data in more than 10 years. It followed two outstanding quarters with record inflows. In the Blend category over the course of 2018, the Morningstar Gold Rated iShares Core S&P 500 ETF (CSPX) saw most inflows, at €4.5 billion, followed by Gold Rated Lyxor S&P 500 ETF (LSPU) at €3 billion. But the iShares offering also saw the most outflows in December at €228 million. The two ahead of it in December were Gold Rated Vanguard S&P 500 ETF (VUSD) at €483 million and HSBC S&P 500 ETF (HSPD) at €244 million. The Growth category is much smaller, with just nine offerings. iShares topped the billing there, too, with its NASDAQ 100 ETF (CNDX) seeing almost €600 million of inflows in 2018, followed by Invesco EQQQ NASDAQ 100 ETF (EQQQ) at €338 million. US stocks have seen a decade of outperformance since the financial crisis, with the two previously mentioned iShares products returning 190% and 290% respectively in US dollar terms between October 2010 and October 2018. But performance turned sharply in the fourth quarter of 2018 and they subsequently lost almost 14% and 17% respectively as the stocks that led the bull run most comprehensively sold-off the most aggressively. That’s led investors to scale back their allocations to US equities in December and January. Global fund managers are now closer to neutral, at 1% overweight, than they have been since June 2018, according to a survey of over 200 global professional investors run by Bank of America Merrill Lynch. True, the sell-off made US stocks as a whole more attractively valued than they have been for a long time, with Richard Clode at Janus Henderson now seeing a number of opportunities popping up in the technology space. But those valuations are still high, certainly relative to other markets. Although down from its January 2018 peak of 36 times, the Shiller price/earnings ratio on the US market stood at around 29 times as a 30 November. This suggests future returns from US equities will be lower than in previous years. “Considering this, it would be prudent for investors to re-evaluate their allocations in the U.S. equity markets,” says Shamik Dhar, chief economist at BNY Mellon Investment Management. He suggests rotating into assets that have seen more valuation pressure over the past 12 months. “Specifically, we expect high-quality stocks in the value universe to hold-up better than high octane growth names during 2019,” Dhar explains. Rory McPherson, head of investment strategy at Psigma Investment Management, worries about stretched profit margins across the Atlantic, which could become even more so should wages continue to rise at as rapid a pace as they currently are. 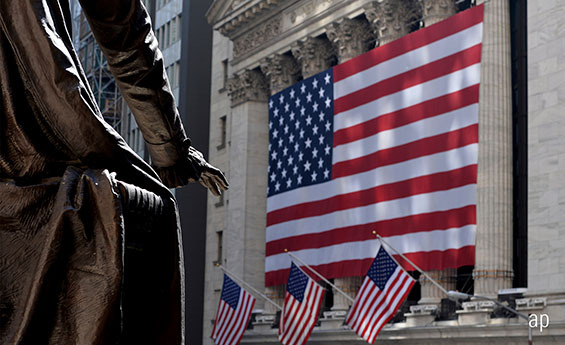 However, counters Tom Becket, chief investment officer at Psigma, it could be argued that US stocks are “reassuringly expensive”, “because we’re in a situation where most of the world’s best companies are in the US”.